This Lenovo F308 & F309 1 TB External Hard Disk comes with an advanced Surge Protection technology that facilitates faster transferring and sharing of data. For convenient usage, it has a slim and compact design and you can easily carry it along in your backpack. The external hard disc has a high rotation speed for superfast data transfer and it is also designed to withstand extreme weather conditions so that any important data is never compromised or corrupted. There is additional 8KV Electrostatic Discharge protection. Moreover, it supports both USB 2.0 and USB 3.0 that is compatible with Windows 7 and versions above it. What is Surge Protection ? Lenovo F308 External Hard Disk Drive comes with Surge Protection for safety and it has storage capacity of 1TB to store data in it. It helps to keep important documents, data files, photos, videos, music and softwares etc. which mean almost each and everything can be stored at on it. As it is external/ portable Drive, therefore, you can move along with all your stuff from one place to another easily with the help of Lenovo F-308 1TB External Hard Disk Drive. It serves you extra storage to store data on it and to free up space from you Laptop PCs and Smartphones as well. 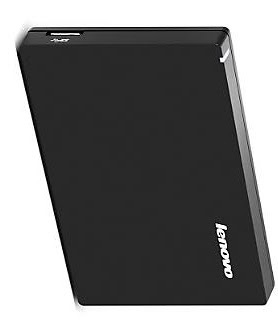 Lenovo F308 is a slim sleek and compact external disk drive and it is very light in weight due to its Weather Resisting hard plastic casing. It is capaple to protect your data even under worst possible conditions. Due to its 8KV ESD Surge Protection Technology which protects your data from electrostatic and magnetic inferences, it is absolutely portable. Dimensions of Lenovo F-308 is 77x13x116mm and it weight is 245gms & its disk size is 6.35cms. It is very easy to use & is small portable/ handy. It has 5400 Rounds Per Minute speed to support transfer of data speedily. Lenovo F308 is latest disk drive which supports USB versions 2.0 & 3.0 both. For connectivity it is compatible with all latest devices that runs on Windows 7, Windows 8, Windows 8.1 and Windows 10. USB. Its USB 3.0 port has support for transferring data at lightning speed, up to 10 times faster than previous old version USB 2.0. It solves all data storage handling purposes whether it is personal, professional or commercial use. Lenovo provides 50 centimeters data cable for connectivity within the box. It is available in Black color. Main Unit of Ext. HDD, 50 centimeters USB 3.0 compatible Data Cable, Warranty Card and User Manual. Warranty : Company has provided 3 Years Manufacturing Warranty and 1 Year International Warranty on the product.